The backyard is the greatest science classroom ever. 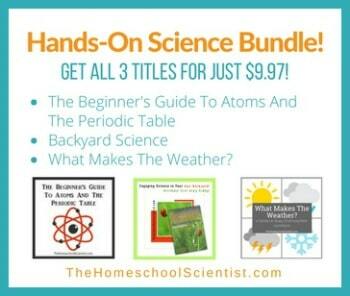 You can launch studies of plants, animals, insects, weather, physics, and more right there at home. All you have to do is open the back door. One of the easiest ways to start an open ended nature study is with a nature survey. They are easy, cheap, fun, and can teach so much. What Is A Nature Survey? When scientists do a nature survey of a section of land, they are basically taking inventory. They are listing all the plants and/or animals in that area. Scientists use this information to learn about the biodiversity of an area. This data is useful in conservation efforts, migration studies, and wildlife management. For example, when I was in college, I participated in a plant survey of an area of land that was going to be cleared for a bicycle path. The survey was done so that we would know what types plants were being displaced. When the path was completed, naturalists used the survey results to choose the plants that would be added back to the area along the trail. There was a time when scientist or naturalists were the only people who carried out nature surveys. They were the only ones the scientific community felt was qualified. These days, scientists have tapped the power of the people. Citizen Scientist projects have cropped up all over. These enlist average citizens with a love of nature to observe and report what they see. Our family participates in the E-bird project from Cornell Lab of Ornithology and National Audubon Society. We simply observe birds in our backyard or favorite park and report what we see online. There are so many citizen science projects that your family can be involved with. Large scale nature surveys can be too much for kids (and adults). I’ve found it’s best to start small and local. Your backyard is the perfect place for your first nature survey. It is safe, contained, and easy. Square foot nature surveys are great for all ages. They are small enough that all kids can get involved, yet they can launch a huge nature study if that’s what you want to do. This video explains how to set up a square foot nature survey in your backyard. Use this square foot nature study to get your kids interested in nature, to build their observation skills, to kickstart a biodiversity study, or to just learn to appreciate the nature in your backyard. So, grab your notebook and your field guide and get outside! You might want to download these free nature printables to help with your nature studies. This is such a fun idea! We’re just starting out on our homeschool journey (completing 1st grade w/oldest) and my kids absolutely LOVE all things nature and animals so this will be fun. I’m glad I found you! I’m following your Twitter and YouTube! Thanks!